The DictOut property provides access to the output fields. 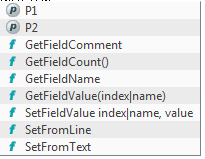 All connected output fields are assigned values from the corresponding input fields automatically by TextConverter for each new input record. You can make any customization to the output values through the DictOut object. You can select an output field or an inner method from the list which appears when you type in "DictOut.". The object is also a collection of the output fields. Each output field has a single property value, which you can set or get.